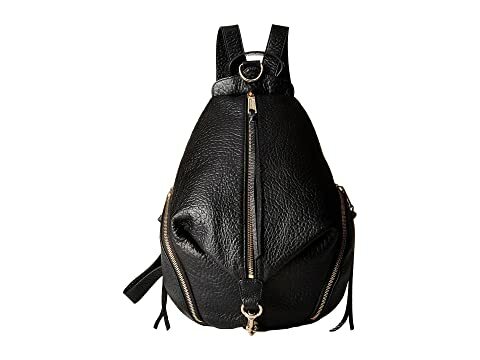 We can't currently find any similar items for the Julian Backpack by Rebecca Minkoff. Sorry! Average rating is 4 out of 5 from a total of 18 reviews. Bag is comfortable on the back and the look of the bag matches the photo. The inside material is black which is different than what is shown in this video. The main zipper and the back zipper work perfectly. The two zippers on the side are hard to open and close which I would not expect from a bag at this price. It should be smooth, but due to the way the zipper is sewn in, the inside panels get in the way and create jagged edges which make the side pockets difficult to impossible to close. Also the back of the bag has huge divets/wrinkles that make it look saggy although the front looks structured and nice. Good travel bag, just don't put anything you need easily accessible in the side pockets, they are almost wasteful due to the zippers. I wanted this bag on recommendation from a friend who has a gorgeous pearl colored one that she's used for years. Hers is buttery soft and smooth. The one I got in the mail (Black4) felt like a cheap bag from a discount store. The straps are stiff and rough on the edges. The leather is plasticky, and the zippers are not easy to open and close. I was very disappointed in the quality. I like the backpack idea, it's truly great. But this bag is very cheap feeling. I had read another review about thinking they had gotten a knockoff, so I did some footwork. I went to my local Nordstrom, determined to find a 'real' one. Well, the one on the shelf there was exactly the same. Stiff, rough, cheap feeling. So, sadly I'm returning this pack. The size is nice and the idea is nice. And actually I can see how someone would love this bag for years if it didn't feel like vinyl. I also don't buy the line that the leather will get softer with time. I've had expensive bags and none of them have started off this stiff. I ended up with another R Minkoff bag (bought at Nordstrom) and the leather is delicious. It's like butter. This bag is a sad member of the collection as far as I can see. I LOVE this bag. I've carried a vintage leather backpack for the last 5 years and needed a replacement, as it's starting to wear out. This bag is comfortable, roomy, stylish, and will last 10 years, easily. The leather was a tad stiff out of the box but softened after only a couple of days. I'm ordering a 2nd one in brown. Highly recommend. I have always been a fan of backpacks, but found them to be too casual for work or going out. When I saw the styling of this bag, I knew I had to have it! The leather is buttery soft, and the fringe and hardware make it look a little badass. It's functional and very stylish. I do wish the back zipper pocket was deeper to accommodate my large 6+ phone, but otherwise it's a good size to fit my essentials. I may get another color as a backup - I know I will be carrying this for years to come! I love this cute backpack. A little more style than a boring pack. Great for trips/flying... Gives you an extra hand for carrying other goodies! Overall: Rated: 2 stars! Comfort: Rated:4 stars! Style: Rated:3 stars!